The Philips AmbiLux UHD grabs your eyeballs by the...er...balls and puts them through some sort of kaleidoscopic interdimensional warp hole. Despite the glitzy launches and top flight devices, it’s all been a bit, well, safe at this year’s IFA, especially around televisions. While other manufacturers focus on 4K delivery systems and HDR standards, it’s taken Philips to deliver the conference’s only truly barmy product. Sure, it’s got the de rigueur 4K specs and a catwalk slim bezel, but those aren’t the attraction. 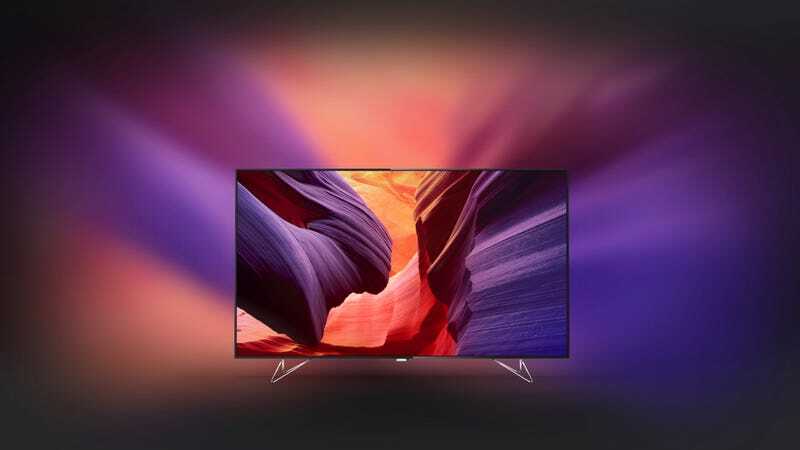 It’s really honestly crazy – though AmbiLight in Philips’ previous TVs was a somewhat distracting novelty, AmbiLux has the potential to do some very interesting stuff, particularly with games as in the clips above. Rather than just smear colours across the walls, the individual projectors allow Philips to pretty much replicate broad shapes. In the case of the Super Stardust Ultra game that Philips was using to demo the TV, this meant that the game’s geometric explosions could extend out beyond the confines of the screen in a defined way. The 65-inch LCD display, which makes use of Google’s Android TV OS and houses four HDMI ports and three USB sockets, obviously performs best against a flat white wall in a darkly lit room, which will limit its appeal somewhat. That’s before whatever (likely) prohibitive price is announced. And there’s the suspicion that, in time, the feature could annoy rather than immerse, especially if you’re watching a narrative film rather than a fast-paced video game where the light show comes as standard. Still, the TV has options to refine the spread of its colourful halo to your specific tastes, from a tight intensely coloured arc to a broader, more muted bloom. It’ll also sync up with Philips’ Hue lightbulbs, letting you extend the lightshow to local light sources, which should help to ease any jarring effect it may have. This post originally appeared on Gizmodo UK, which is gobbling up the news in a different timezone.